Live in the Houston area? This Wednesday, April 8, at 11:00 am, Houston Community College will be showing both FIGHTING GOLIATH: TEXAS COAL WARS and FLOW: FOR LOVE OF WATER as a part “The Reel” Series, a culture film/speaker series of learning enrichments. Public Citizen’s own Ryan Rittenhouse will be on hand after the screening for a Q&A session and to give an update on the Texas coal fight. The screening will be held at the Town & Country Center in the “Eagle” room at 1010 W. Sam Houston Parkway N. 77043. The event will be free and open to all HCC students, faculty, staff, and friends. 11:00 a.m. FILM: (84 min) FLOW: FOR LOVE OF WATER The World Water Crisis is what experts label the most important political and environmental issue of the 21st Century. “Flow” takes us to Bolivia, South Africa, India, Michigan and beyond, and introduces us to issues of water wars, privatization, pollution and profit and the people who are being harmed by corporate tyrannies that are claiming the water of their land. Award-winning, 2008. 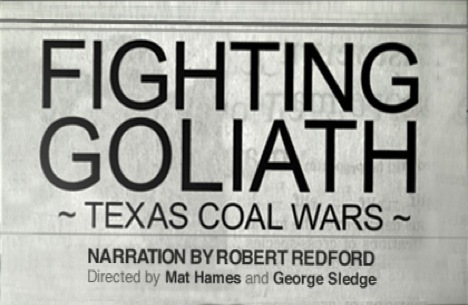 1:00 p.m. FILM & SPEAKER: (30 min) FIGHTING GOLIATH: TEXAS COAL WARS Narrated by Robert Redford, the (2007) film follows the story of Texans fighting high-stakes battle for clean air. Film centers around unlikely partners — mayors, ranchers, lawyers, cities, citizens, green groups, and CEO’s — who came together to oppose the construction of 18 coal-fired power plants in Texas.